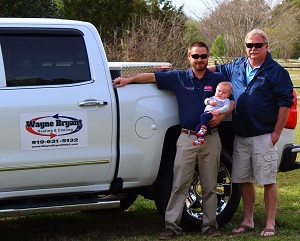 Wayne Bryant Heating and Cooling LLC is a locally owned, licensed and insured company located in Fuquay-Varina, NC. We know that weather in North Carolina can certainly unpredictable so our goal is always to minimize your frustration while maximizing your comfort. We offer our services 7 days a week to customers in the Wake, Johnston, and Harnett County region. So if you are looking for an air conditioning and furnace repair company to service or replace your heating and cooling system that you can trust, look no further than Wayne Bryant Heating and Cooling. As a family-owned company, we strive to treat each of our customers like family. We try to offer a number of resolutions to every problem and pride ourselves on being honest with our customers to help them find the best solution to fit their needs and budget. We are proud to serve Wake, Johnston, and Harnett Counties, in cities and towns including Fuquay-Varina, Clayton, Garner, Willow Spring, Holly Springs, Lillington, Angier, Apex, Cary and the surrounding areas. If you would like to learn more or work with us, please call or text us at 919.631.5132, send us an email, or you have two other options. You can fill out the contact form to the right, and we will be back in touch as soon as possible or else you can click the ‘Book Online’ button below for quick and convenient appointment scheduling!